People talk about ghosts of Tiger Stadium (which turns 90 on Tuesday, by the way). Usually it’s positives like Billy Cannon’s Halloween Run in 1959, the 1988 Earthquake Game against Auburn, the five fourth-down conversions against Florida in 2007. There were a couple of other classics against those opponents and others. There have also been negatives. One negative was when the Tigers went 30 years without a win against Alabama at home. Even though Bear was only there for about the first 1/3 of that time, it was like his ghost was still on the sidelines, pushing the Tide to victory in a way that it wasn’t even present in the state of Alabama. Other than the national championship, one of the main things I’m grateful for from Saban’s tenure is the fact that he had two home wins over Alabama, the first of which ended that long streak. Neither win came against a great Alabama team, but that wasn’t important. Just like it wasn’t important how young this LSU team was or how well Ole Miss had played in previous games this season. In January, it will have been ten years since Nick Saban coached an LSU team. 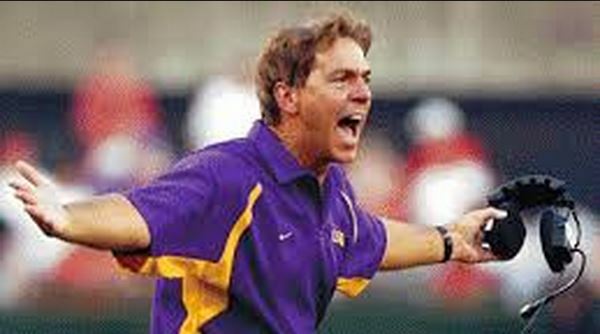 The ghost of Bear might be gone now, but now there is a living ghost in the collective psyche of LSU fans by the name of Nick Saban. Some still openly regret the fact that he’d left and wanted him to come back. I’ve heard from multiple sources there was a group of boosters who thought they could get Saban back if Miles were to leave. Others bitterly resent what they see as his betrayal of LSU by going to Alabama. I believe like most supposedly supernatural phenomena, this ghost is present in our minds only to the extent we allow it to be, but it’s been really hard to shake since 1/9/12, that fateful day that ended what would have been LSU’s first undefeated season since 1958 (although LSU still won two more games in 2011 than it had in 1958). It also prematurely ended what should have been at least 24 consecutive months of bragging rights over the Tide and gave Alabama another national championship to rub everyone’s noses in. To backtrack a bit, I want to note that very few people mind the fact that he went to Miami. He had rejected many NFL offers out of respect for LSU, and he was still of the age that it made sense to give it a try. Also Wayne Huizenga, the owner of the Dolphins, had bent over backwards to accommodate Saban’s every contractual demand. The betrayal was going to Alabama. Alabama may not have ever put too much emphasis on beating LSU, but the same could not be said of LSU’s priorities. Of course, Alabama was not what it once was in 2007, but I think most LSU fans knew it would only be dormant for so long. For the catalyst of Alabama’s return to be Nick Saban was the ultimate slap in the face. Both LSU and Michigan St. (his two stops before his brief experiment with NFL head coaching) fans took part in derogatory chants against Saban a couple of weeks ago. The Michigan St. fans did it when Chris Fowler interviewed Saban by satellite (if that’s even still the technology used), and the LSU fans did so in person when the Tide came to Tiger Stadium. What annoys me more though is the perception by some that LSU and Michigan St. owe any success in the last few years to Saban. I wanted to set the record straight on some things, because Saban did not have anything close to the kind of improvement or level of consistency he’s had at Alabama since 2008. I could probably write a book about all the things I like and don’t like about him and my observations of him as a person and a coach over the last 20 years (I clearly remember Michigan St. both before he took the job and during his time there), but I just want to focus on what exactly changed at Michigan St. and LSU when you look at the results on the field. I also want to consider the argument or suggestion that if he’d stayed at LSU, the LSU football team would be what Alabama has been over the last five seasons. Saban’s last year at Michigan St. was a good one; but before that, his teams were just about as mediocre as they were under his predecessor there (although to be fair, 6-5-1 and 6-6 at least aren’t losing seasons, which his predecessor had suffered a couple of times). Still, Saban’s second-best season there was only 7-5. I don’t want to dwell on Michigan St. too much — his last season there was 15 years ago — but in his first season gone, they went right back to 5-6, which they had finished the year before Saban started there. That was a long-term impact of approximately 0. In fact, you can go out even further. In the five years before Saban, Michigan St. won 48% of its games. In the five years after he left, Michigan St. won 48% of its games. What are fans today supposed to thank him for again? Other than memories of the 1999 Citrus Bowl? It doesn’t take a great coach to have a single ten-win season in five years. I don’t think any major programs are beating down the doors of Will Muschamp, Larry Coker, Gerry DiNardo (Saban’s full-time predecessor), or even Gene Chizik, who has a national championship to his credit. Another example from the SEC, David Cutcliffe, took a long time to get back into a head coaching job despite having led Ole Miss to its best season in decades in 2003. Saban did step things up in his fourth and fifth years at LSU, but the Tigers had a combined 12 losses in his first three years. The conference championship in 2001 was a fluke. How often has the SEC champion had three conference losses? How often does the SEC champion have a loss by 29 points at home? LSU had worse in the previous two seasons than Michigan St. had had immediately before Saban but had two season of the previous four with wins of 9 games or more, whereas the last time Michigan St. had won even 8 games was five seasons before Saban got there. LSU likely had better athletes to start with. After being a dormant program for 6 seasons, DiNardo did have some initial success. In his first season, he led the Tigers to only their second bowl win in 16 years, and it was over Saban’s first Michigan St. team. This was followed by a 19-5 record over the next two seasons, which included a win over defending national champions Florida in 1997. Also, Louisiana is more fertile recruiting ground for recruiting than the state of Michigan, and LSU isn’t “little brother” to anyone in the state of Louisiana. It was not that difficult to have a spike in Louisiana recruiting. It also wasn’t the case that DiNardo couldn’t develop players, which he clearly did given some of the close results against good teams. He just lost the ability (partly due to turnover among his assistants) to manage the team to wins. I’m sure that put a damper on recruiting in the 1998-99 offseason, but LSU would finish the 1999 campaign with a strong win over a ranked Arkansas team (with an interim coach), and the hope that the hire of Saban brought (probably as much as or more than Saban himself) kept the recruiting after the 1999 season from being a problem. If they could beat a ranked team with a no-name interim coach at the helm, the sky was the limit. Nonetheless, Saban’s first three seasons were actually worse than DiNardo’s first three by record, and there had been no winning seasons that preceded any of the recruiting classes DiNardo worked with in that time. Saban’s 9 wins in his final season were good in the context of the 12 years before his arrival, but I don’t remember Les Miles getting a ton of credit for following a national championship season with 8-win and 9-win seasons, respectively. Nor did he get a lot of credit for winning 33 games in the past three full seasons combined. Saban’s best three years at LSU together didn’t account for that many wins. One of the other coaches I mentioned likely could have coached Saban’s 2004 team to 9 wins or more. Also, the loss to Georgia that season was reminiscent of the handful of bad losses Miles has had. So there was really only one season at LSU that was better than what had taken place at LSU the five seasons before Saban’s arrival. As he did at Michigan St., he did raise the floor at LSU. When things didn’t go well, he went 8-5 and 8-4 instead of 4-7 and (starting) 2-8. That was an improvement, but just like with Michigan St., he only raised the ceiling in one year. In both instances, those singular seasons caused his stock to go through the roof (continuing with the housing analogy), although he did decide to stick around at LSU another year anyway. Also, it’s not just wins and losses on their own. There were baffling losses under Saban. In his first season, he lost to Florida by 32, he lost to UAB (with only 10 points scored), and he lost to an Arkansas team (which had gone into the game with a losing record), 14-3. It’s not good if you have three games where you score 10 or fewer points and four games where you score 17 or fewer. The next year, they had the opposite problem. The offense was only held under 20 twice, but they allowed 44 to Florida, 25 to a bad Kentucky team, 35 to Ole Miss, 38 to Arkansas, and 34 to Illinois. 2002 was all over the map. They scored 14 or fewer four times, but they scored over 30 seven times. They allowed over 25 points five times. 2003’s team only had a single loss, but it was an ugly one: 19-7 at home against Ron Zook’s Gators. The Tigers struggled offensively at times against the better teams such as Georgia, Ole Miss, and Oklahoma. It helped that that team was able to play 6 teams with losing records and a I-AA opponent. Before the last four games of that season, LSU had not played two teams back-to-back that would finish with winning records. Contrast that with Miles’ last couple of seasons. The 2004 team did not have a stellar offense, and LSU actually hurt themselves by trying to start JaMarcus Russell too soon. They nearly lost to Florida before Marcus Randall came off the bench to lead a comeback. They also needed Oregon St. to miss a few extra points in order to win the opener by 1 point in overtime. I already mentioned the Georgia loss that year. LSU scored over 40 points three times that year (against teams with a combined 11 wins), but their highest point output otherwise was 27 against an Ole Miss team that finished 4-7. They only managed to score 24 apiece against the likes of Troy and Vanderbilt. This was with Jimbo Fisher as the offensive coordinator. To apply the criticism Miles gets to Saban, he must have been holding the offensive coordinator back, right? It would seem to apply to Saban even more. In fact, I’m calling it right now: Cam Cameron is not going to be the head coach of a national-championship team in the next 10 years. One could have also argued Saban only developed one “real” quarterback (Matt Mauck, whom he actually first recruited during his Michigan St. days) in those five years. Saban was there when Russell came to LSU, but I’m sure that had more to do with Jimbo. Also, Russell didn’t really come into his own until the middle of his last year, which had nothing to do with Saban. Point being, if you start from the perspective of looking to blame the head coach for everything, Saban could have taken a lot of blame as well as credit during his time at LSU. I think people just don’t realize how much their expectations have changed, which made every big win Saban had wonderful and every loss (or sometimes even close win) under Miles tragic. So if we’re going to be assigning blame, we can blame Saban for causing LSU fans to forget what a losing season feels like. I still don’t think we have him to thank for the 7 double-digit-win seasons since he left, although of course he was instrumental for at least the first couple of them. The LSU fans who do have this pathetic sense of longing for Saban are misguided. Alabama has certain advantages that LSU just isn’t going to have. I don’t buy into conspiracies, but I think there is a natural degree of deference they get from recruits, from referees, from the media, from conference officials (who, perhaps not coincidentally, are based in Alabama), etc. Notre Dame has not had a sustained presence atop college football in 20 years. For Nebraska, it’s been about 15 years. So Alabama is the focal point of the historically great programs right now. There is just a different level of mystique for such programs. Nick Saban or not, that wasn’t going to be LSU. People can’t accept that though. They just think that had Saban been here in 2009, 2011, and 2012, we would have had three national championships in those years rather than none. Maybe Saban wins in 2011 with either team (although even that’s arguable), but I’m doubtful about 2009 and 2012. What if LSU (rather than Alabama) had been undefeated in 2009 and threw an interception on the game-clinching drive against Alabama. You think that gets ruled incomplete and LSU goes on to kick the field goal anyway? LSU got some flak for winning in 2007 with two losses, but at least they won the conference, unlike Alabama in 2011. Let’s say LSU loses a home game to Alabama like they did this year and everything else plays out like 2011. Do you think LSU gets a re-match over a one-loss champion of another conference? I doubt it. LSU hasn’t gotten a soft touch at all in their slate against the SEC East even though their annual opponent (Florida) has been better than Alabama’s annual opponent (Tennessee). The previous two seasons have had “bridge” schedules, temporary stop-gaps before they started off the new rotation, which was formalized before this season. Alabama drew Missouri in 2012. Missouri played in the 2011 Independence Bowl, but they had an anticipated lull in adjusting to the SEC slate in 2012. In addition to the one good Muschamp team (which would only lose one SEC game), LSU had to play South Carolina, which had gone 11-2 in 2011. South Carolina would finish with the same record in 2012. If you switch both SEC East opponents around, chances are LSU goes to the SEC Championship game instead of Alabama in 2012, even assuming Alabama still beats LSU in the closing seconds. Point being, I don’t think had Saban coached LSU that year (even if he had players just as good as the ones he had at Alabama), he would have beaten both Florida and South Carolina. In 2013, LSU got Georgia, which had nearly beaten Alabama in the 2012 championship game, while Alabama played Kentucky, fresh off another losing season. Again, that scenario does not get reversed if Saban coaches LSU instead of Alabama. It was an extra advantage for Alabama because what turned out to be their top challenger, Auburn, had to play Georgia also. Auburn had a favorable bounce and there were some unfortunate injuries to Bulldogs players between playing LSU and Auburn, but that could have easily been another Alabama divisional win (even with the Iron Bowl loss) owing in significant part to the schedule. A Saban team might have won another game last season at LSU, but if they don’t end up winning two more, they don’t win the championship anyway. So all things considered, maybe Saban wins one more championship than Miles did over the last 10 years (that’s right, this is the 10th LSU season after Saban). On the other hand, maybe they don’t win in 2007. You might blame Miles for the OT losses, but maybe Saban loses games to Florida and Auburn (there were some gutsy calls Saban may not have made) and they either lose a third somewhere along the way or someone else wins the division. So it could even be the same number of championships. I don’t mind the idea of looking at the unmatched level of success Alabama has had over the better part of the last seven seasons (the only time a program had done anything like that in my memory was Nebraska in the mid-1990s) and wanting to match that, but just get over the fact that the head coach there coached LSU 10 years ago. That goes for people who want to insult him and those who wish he’d stayed (or fantasize about his return) alike. For those who persist in being hung up on Saban, at least get your facts right.